Dogs rule at Town & Country Pet Care Center. 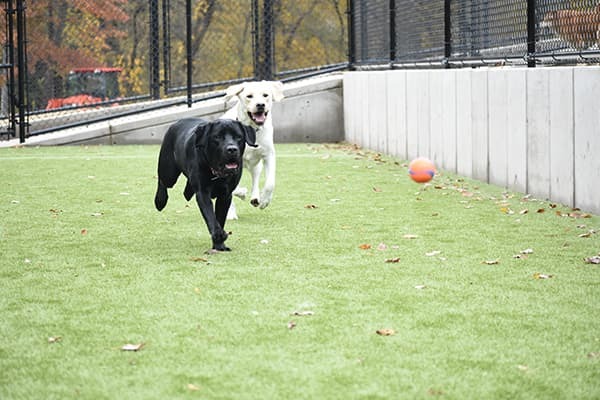 Our indoor & outdoor dog daycare is a supervised, safe, and clean place for dogs to romp and play. All daycare guests are thoroughly screened for social compatibility and grouped by size, play style and temperament for a fun & safe visit. We've conveniently located in Langhorne, PA. Reservation required. Discount subject to availability and cannot be combined with any other offers. Daycare discount applies to first-time daycare customers only. Why do area pet parents choose Town & Country for doggie daycare? Our 7 outdoor play yards are securely fenced and covered in special turf. Our brand-new indoor daycare keeps the fun going in all weather. Rubber flooring makes for soft landings and healthy joints. 100% supervision by highly-trained & dog-loving daycare staff. 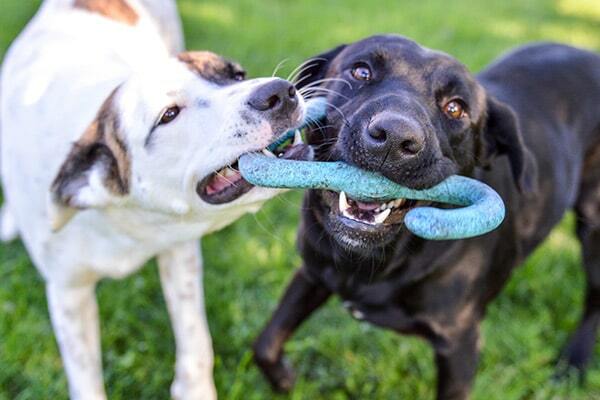 Top-shelf playground equipment and games that dogs adore. Water sprayers and kiddie pools keep pups cool on hot days. Daily hospital-grade disinfecting keeps our facility one of the cleanest in the area. Playgroups are carefully chosen based on size, temperament and age. We specialize in small playgroups for maximum safety and comfort. All daycare guests undergo a thorough behavioral evaluation. Is Quality Daycare Beneficial for Dogs? Yes! 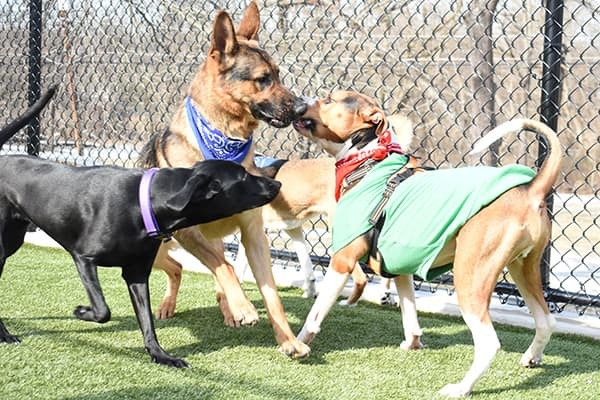 Doggie daycare helps dogs of all sizes and ages learn good social skills, so they can build confidence and interact better with people and dogs. It also provides necessary intellectual stimulation, entertainment, and physical activity to help your dog be a better canine citizen. While your dog is in our daycare program, you won’t have to worry about how he’s entertaining himself at home. When you pick up your dog after a day of playing with his friends, he’ll be ready to spend a relaxing evening with you. It’s a safe, controlled environment supervised at all times. Plus, veterinary professionals from the on-site Buxmont Veterinary Hospital are on hand. Enjoy peace of mind while you’re away knowing your dog’s being engaged and constructively stimulated. Daycare decreases separation anxiety by keeping your dog occupied in healthy and fun ways. It’s a chance to meet and play with new canine and human friends!